As per usual with me, a slightly late post. 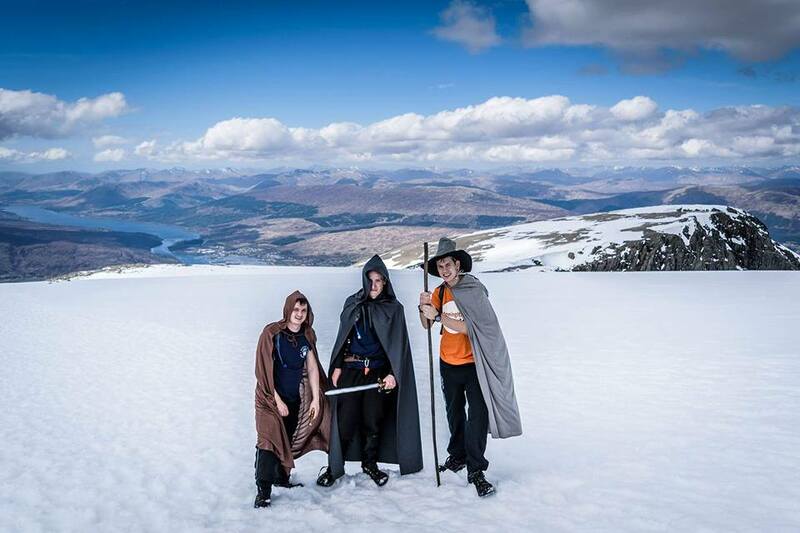 On Friday the 6th of may 2016 at midday, me and 4 of my friends (dressed as lord of the rings characters) set of our journey to try and conquer the three peaks challenge in aid of charity. For anyone that doesn’t know what the challenge is, you have to climb the three tallest mountains in the UK in 24 hours, including the driving. These mountains being Ben Nevis, Scafell Pike and Snowdon. This little adventure had been about 6 months in the planning and we had finally come to give it a go. I wish i could say it was all plain sailing from the start however this was far from true. We initially had sorted a driver for obvious reasons. However he had to unfortunately stay behind and wasn’t able to make it. Meaning myself and two of my other friends were having to do the driving. So anyway we set off, a lovely day up ben nevis which by the way is a great climb, even though we were rushing i really enjoyed the climb and the decent. Don’t get me wrong its a busy route! however the track is more than substantial enough for people to pass. The views up ben nevis are incredible like nothing I’ve seen before. Also the fact it was T-shirt weather at the bottom and very thick snow at the top was pretty amazing too! Unfortunately as you may have noticed from the main display picture we did loose a member of the team part way up Ben Nevis due to illness, however he was fine with some rest. Onto the second mountain. Scafell Pike. I don’t have much to say about this as it was 23:30 by the time we started the climb and in all honesty this was the definition of hell for myself. I can imagine it is probably a fairly interesting climb in the day. However at night with tunnel vision from the torches and aching legs it was far from a pleasant experience so the less said the better in my eyes! Finally we faced Snowdon. we arrived just before 07:30 in the morning on the Saturday. All understandably tired. Originally we were taking the pig trail to the top and back down again but i have to admit i felt my legs needed a bit of a warm up before hitting the fairly steep climbs early on. So we took the miners trail up to the top which does sta rt nice and level…ish. but about 45 minutes in gets very steep and rocky very quickly. I did quite enjoy this climb, it was hard but the Finnish was in sight, the surrounding were absolutely stunning and we had regained the fourth member of our team for the final climb! As it was nice and early we had a clear run to the peak. An incredibly windy peak at that but it was stunning! We had made it, climbed to the top of three mountains, we just had to get back to the car to be able to record our climb. On the way down we took the pig trail as it was shorter. In hindsight we should of gone back via the miners trail again as the volume of people had drastically increased and proved very difficult to navigate our way down. After dodging all of the HUGE tour groups we finally made it back to the car. We had finished in an absolutely incredible 23hours and 10 minutes exactly! You can imagine how happy we were with this result! In conclusion, this was quite possibly the single most difficult thing i have ever done physically in my life and there is no way on earth i will every do it again as a combined challenge. However I may climb them individually and enjoy the journey. Saying that though i am glad i did it, if I’m being honest I’m even proud of myself. I would recommend it to anyone who fancies having a go. I will say just don’t think its going to be a breeze, it’s not! Now for our next adventure! !